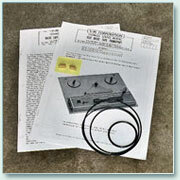 On this page we have assembled the most popular and needed parts to mechanically restore your Voice of Music tape recorder or other brand recorder with V-M Corporation built tape transport into kits. Click on Do I have a V-M tape recorder deck? 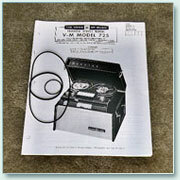 to help you identify if your tape recorder has a V-M built tape transport. Parts may also be ordered individually and …. 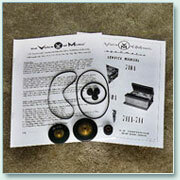 we have many, many, many other V-M tape recorder parts – and Owner’s Manuals too! The V-M Service manual is your parts “catalog” – Contact Us with your V-M model number and needs and we will quote availability and price!